The USB 2.0 2-port hub that allows you to add multiple high performance USB 2.0 peripheral devices to your PC. The USB 2.0 hub is fully compliant with the USB 1.1 specification, i.e., your previous USB 1.1 devices can continue to function as usual. 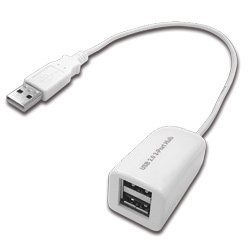 This convenient device allows you to connect up to a maximum of 127 USB devices to your PC through daisy chain.